These Diamond Flexible Polishing Pads, offered by us, are suitable for shaping and polishing corner angle and the inside and outside arc of the stone surface. 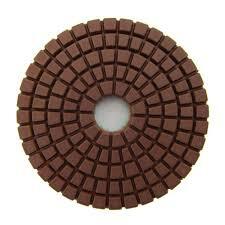 This Resin bond Diamond Polishing Pads are made with top quality diamonds and resin. This is for high gloss finish on all the stones and is very economical. The Diamond Polishing Pads, we offer, are available with color coded Velcro backing and can be bent or distorted freely and are available in various mesh / grit sizes.